In this paper, I explore the question of interpretation by focusing on the role of mediation in consciousness expansion and re-emergence of the subjective Self. As all mediation depends upon some kind of agency through which it is conceived, realized and assessed, I inquire into the agency of mediation as a fundamental aspect of interpretation. To this end, I consider interpretative mediation as a symbolic vehicle of human experience and expression, informing a re-constitutive multiplicity of social and personal approaches to the question of the interpretation of reality. I argue that the idea of interpretative mediation is culturally-historically intertwined with the idea of othering, or the constant reconstitution and re-emergence of the Self. My thesis is that through â€œothering,â€ which is a distinctive quality of homo sapiens sapiens, humanity can be realized as a comprehensive and integrated state of being in the world through a series of interdependent states of consciousness. Othering prepares the way for self-realization and helps to establish the emergent states of ego-transcendence. To substantiate my argument concerning the interpretative agency of mediation and its constitutive role in the semiosis of experience and expression of reality as a process of othering consciousness, I draw upon the cultural psycho-dynamics of a paradigmatic institution of Greek history and mythology, the oracle of Delphi. There are two diametrically different trends in the study of shamanism. One is restricting the term to Siberia. The other accepts everything connected with trance, prophesy, and ecstasy as shamanism. It is interesting to note that Ancient Greece and Rome occupy different positions with regards the topic. Shamanism in Ancient Rome is hardly ever dealt with in scholarly studies. But there are several attempts to sum up data in Ancient Greek sources under the label â€œshamanismâ€. Erwin Rohde, E. R. Dodds, F. M. Cornford and others have discussed the topic, and Eliade in his summarizing work Le Chamanisme (1968/1978) duly refers to them. However, the final judgement is not clear: whether or not we once had shamans in Ancient Greece. 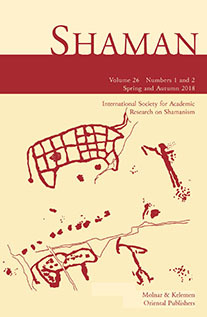 Hungarian shamanologists have paid much attention to the term rejt/rejtÅ‘zik (a verb: â€˜to hide, to be hidingâ€™) â€“ connected with the oldest vocabulary of shamanism among the Hungarians, i.e. from a thousand (or more) years ago. That is the reason why I start with a well known name of a Homeric nymph, Kalypso (ÎšÎ±Î»Ï…ÏˆÏŽ) , which means â€œthe hiding/hidden oneâ€, derived from the verb ÎºÎ±Î»ÏÏ€Ï„Ï‰ â€˜to cover, to cover oneself, to hideâ€™ and is connected with common nouns as â€˜cover, veil, envelopâ€™. If we read Homerâ€™s text, we can go further in deciphering Kalypsoâ€™s â€œshamanismâ€. In the field of Greek mythology the term â€˜shamanismâ€™ most frequently occurs in connection with Apollo. The most typical motif of classical shamanism, extracorporeal travels of the soul are mentioned only peripherally in the texts; generally the effect of Apollo on the human soul is the same as in the case of other gods of the Greek religion: he is able to induce possession. But this possession is radically different from its equivalents caused by other gods, e.g. Dionysus or Meter ( also called Kybele), the pathological character of the latter was clearly detected even by the Greeks. Apollonic ecstasy does not lead to the loss of the consciousness or the loss of the moral sense. We may assume that in some cases the Greeks interpreted an experience of shamanistic character as a divine possession, because the conceptual frameworks of the Greek religion gave them no other possibility. In my paper I analyze the figure of Apollo as he appears in the hymn to Hermes. Here the central character is Hermes, and the aim of the text is to explain his functions, but it achieves this goal through contrasting him with Apollo: Hermes becomes Hermes by the fact that Apollo shares some of his functions with his younger brother â€“ as a result Apollo himself is being formed in this exchange, and the final result is an interdependent pair of gods. This complementarity affects those functions of Apollo where he is able to influence the human mind: poetry and divination, and apparently he borrows certain features of his trickster brother: the prophetic god is Loxias, â€œobliqueâ€, ambiguous.